As Hurricane Harvey made landfall this weekend, Texas hospitals tried to stay safe and operational using such tools as submarine doors and elevated power supplies, both improvements set in motion after Tropical Storm Allison struck in 2001. Some, like the University of Texas MD Anderson Cancer Center's Houston facilities, remained closed Monday, as water flooded into their lower levels. But others, like Christus Health's Houston-area factilities, were mostly fine by Monday morning, two days after HHS Secretary Dr. Tom Price declared a public health emergency in the state, where floodwaters still threaten to rise. In 2001, during Tropical Storm Allison, some of Texas Medical Center's 23 hospitals were devastated, with structural damage and research lost. Texas Medical Center facilities flooded, forcing patients to be evacuated, sometimes in the dark. Animals in the Baylor College of Medicine's basement died in floodwater. 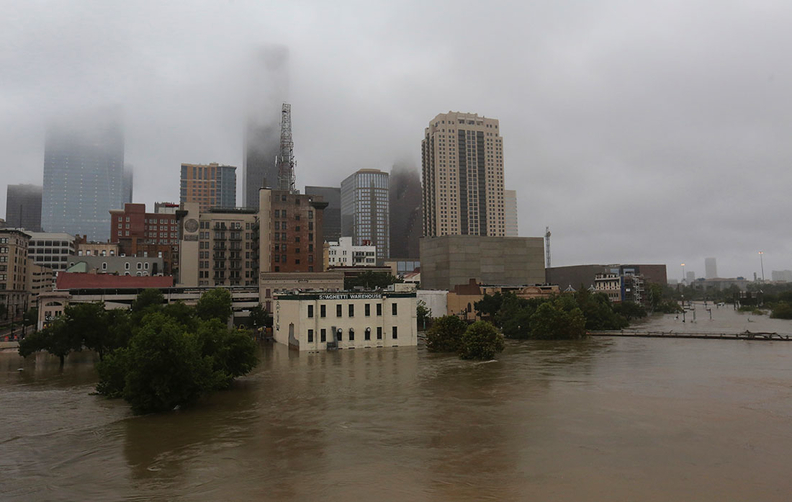 If there was a silver lining, it was that the storm catalyzed a slew of flood protections, including new floodgates, above-ground electrical and water-pump systems, animals kept on higher floors, and, for UT Physicians, battery backups for refrigerators that store important medications (such as tetanus vaccines). As of Saturday, each of Christus Health's hospitals had a seven-day water supply on hand, and Christus was preparing to distribute the water in Corpus Christi, which had issued a boil order for water. "We have to ensure that our facilities are better prepared to handle these storms," said Christus CEO Ernie Sadau, explaining that in the last 10 years, the system has focused on strengthening its buildings, installing windows and roofing materials designed to withstand Category 4 and 5 storms. "We had some damage, but when you look at everything we feel like we were pretty fortunate," Sadau said. Christus had minimal flooding, he said, and didn't have to close any facilities. Like Christus, Texas Medical Center—which spent billions on fortifications after Allison—relied on flood doors to keep water out. The organization also tracked rainfall in real time, using a flood alert system put in place as a result of Tropical Storm Allison. But the protections could go only so far: The basement of one of the Texas Medical Center's facilities, Ben Taub Hospital, flooded, damaging its power supply. The hospital attempted an evacuation that was slowed by the water that surrounded the structure. News of the flooding spread quickly online through videos and text snippets. Unlike during Tropical Storm Allison, this time hospitals in Texas have a major tool: Twitter. Many took to the social media site to tweet out updates throughout the weekend—and to stop misinformation, as Houston Methodist did when it corrected a rumor that its Texas Medical Center hospital was flooding. The tweeting began before the storm struck, with hospitals posting emergency alerts ("Tips for Expectant Moms and Families," from Texas Children's Hospital; retweets of the National Weather Service, from Texas Medical Center). Though some preparations, like the installation of flood gates, took years, other offline preparations mimicked those on Twitter as hospitals quickly spun into action. On Friday, Baylor Scott & White Health encouraged central Texans to donate blood. Later Thursday into Friday, the Driscoll Children's Hospital, in Corpus Christi, sent babies from its neonatal intensive-care unit to a hospital in Fort Worth, pre-emptively protecting them from potential power disruptions to their ventilators. Other hospitals postponed elective surgeries—with announcements coming, of course, on Twitter, where early Monday morning the National Hurricane Center warned of "ongoing catastrophic and life-threatening flooding." According to the hurricane center, there are still 15 to 25 inches of rain on the way. In the face of the ongoing rain, Sadau said, "We're there for the community." An​ edited​ version​ of​ this​ story​ can​ also​ be​ found​ in​ Modern​ Healthcare's​ Sept.​ 4​ print​ edition.